Advance tickets to TFcon Charlotte ends today! As per the TFcon Facebook Page if you were planning to buy your ticket using your credit card today will be your last chance to do this, ticket sales will be cash only at the door this weekend. Additionally TFcon has announced Transformers artist Dan Khanna will be attending the 2015 convention in Charlotte. He will be selling prints and offering original art to attendees all weekend long. He has provided package art for the Transformers brand over several different sub-lines. 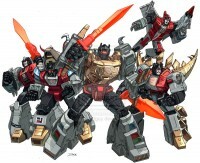 TFcon Charlotte – America’s largest fan-run Transformers convention will be the weekend of October 16th to 18th, 2015. TFcon Charlotte will take place at the Embassy Suites Charlotte Concord with special guests GREGG BERGER the voices of G1 Grimlock and Jetfire as well as DAN GILVEZAN the voice of Bumblebee in Transformers Generation 1, RICHARD NEWMAN the voice of Rhinox in Beast Wars and JAMES ROBERTS the writer of the fan favorite comic book series Transformers More Than Meets The Eye, plus G1 writer and story editor FLINT DILLE, along with comic book artists Alex Milne, Casey Coller, Brendan Cahill and Corin Howell. Online registration for TFcon Charlotte 2015 attendee tickets are still available via the TFcon Admission/Registration/Ticket Information page. I want to apologize for the lack of information this year for the Official MegaToyFan parts party. I would like to blame it all on Delta Airlines but….on second thought….yeah it was all their fault. In any case, we had a great time and for those who did attend I hope you had as good of a time as I had. We look forward to next time. Transformerland parts party now open room 504. 1000s of g1 and modern parts g1 thru modern. Freebies! Does anyone know the start time/room no. for the mega toy fan parts party? So this is my first TFcon and I was curious what is the dealer room like? Packed? Do people bargain or haggle? Is there a lot of stuff or only a little? It looks huge from all the fan videos and tf fans I've spoken with, but I am just curious and excited!! You'll know tomorrow just like the rest of us. Compared to last year I'm expecting it to be quite large. When is set up time for dealers on friday? Dealer setup will begin no earlier than 2pm, depending on how fast the room is ready. I'd plan for about 3. No Roberts AND no Milne? Arrrrghhhhhhh! I'm ridiculously bummed! …but I sincerely do hope Alex feels better soon. Might want to update Alex Milne won't be attending either, health issue is forcing him back home and he just arrived in North Carolina. I'm also wanting to know how to find out what retailers are going to be there and how to contact them about certain items. Is it normal to contact online retailers and ask about/request certain items for the convention? I have never heard of wanting to contact retailers and request certain items for the convention. Normally, it is first-come-first-serve but retailers usually have a good supply of items that are current and maybe a few years old. TFsource, The Chosen Prime, Toy Dojo, Captured Prey, Ages 3 and Up are just a few of the exhibitors that will be there. Most likely TFSource will be there since they were in the dealer room last year in Chicago.